A1307 HAVERHILL TO CAMBRIDGE CORRIDOR DRAFT CONCEPTS REPORT published by Cambridge County Council. In this report, transport concepts into Cambridge along the A1307 corridor are proposed. One such concept appears to be that of an off highway rapid transit route leading over Magog Down from Babraham Research Campus into the Addenbrooke’s Hospital and Cambridge Biomedical Research Campus. Such a proposal fills us with dismay. There appears to be a dismissal, or lack of knowledge, of both the conservation and archaeological value of the Gog Magog Hills along this route. Not only does a Neolithic causewayed enclosure circle the summit at Little Trees Hill, but the surrounding countryside has been part of an important conservation project over the last 25 years, to re-establish chalk grassland flora: an increasingly rare habitat in the UK. Should this route be confirmed – it is difficult to know exactly what is proposed at this stage – the Trustees of The Magog Trust will do all in their powers to fight for this precious corner of the county, which has been bought for us and our children’s children to enjoy in an increasingly developed landscape. The Joint Assembly of the City Deal meet this week to agree and make recommendations to the City Deal Executive Board on the next round of public consultations. This will include proceeding with the A1307 Cambridge to Haverhill component of the wider City Deal proposals. 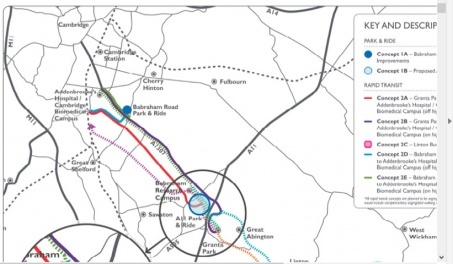 One of the options (2a) in the Draft Concepts Report produced by the consultants WSP/Parsons Brinkerhoff includes a new cross-country bus-only route from the Babraham Research Campus to Addenbrooke’s that appears to cut right through the middle of the Gog Magog Downs. 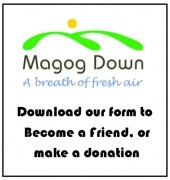 It is shown on the map as coming down the hill approximately where the Magog Down’s car park is located. We understand that this only the beginning stages of a long process and that formal consultation is unlikely to happen before June. However it seems extraordinary to include such an important environmental and recreational site, even at this early stage, and CambridgePPF query what if any environmental considerations were included in the consultant’s terms of reference. Based on what we have gleaned from the limited information available, CambridgePPF sincerely hope the City Deal options for public consultation will not include such an inappropriate proposal. UPDATE: we were relieved to see the reassurances published in the Cambridge News on 18th February. We will remain vigilant with regard to any future proposals that could impact on the conservation and recreation value of Magog Down.